Here's what I have been busy crocheting for a Christmas gift for my Granddaughter, my version of a pattern created by Marken of The Hat & I, called "Owl Obsession". I really enjoyed this pattern and the open-ended possibilities one can use in recreating this design. In my revisions, I used 2 different colors of yarn in recreating the owls, I crocheted the eyes completely instead of using a button for the iris, I joined the motifs through the front using a complimenting multi-colored yarn, and I added a border that reminded me of feathers. 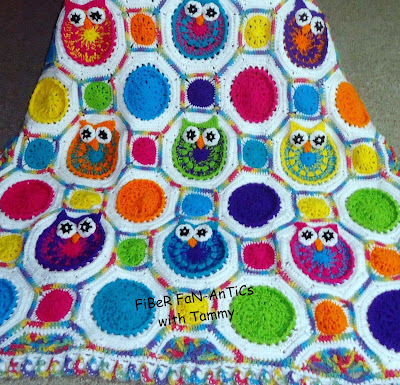 The pattern can be purchased through Ravelry here: http://www.ravelry.com/patterns/library/owl-obsession and the original pattern image made by the designer is displayed below. I want to make a few more using the suggested yarn. It's so lovely!